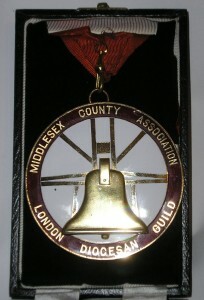 The Association was formed in 1897 by a union of the two Middlesex societies that existed at the time. In 1874 a meeting had been held at Isleworth to form the West Middlesex Bell ringers’ Association, with members from Isleworth, Richmond, Chiswick, Fulham, Heston and West Hillingdon. At that time the only other such society was the East Derbyshire Association, which had been formed in 1870. Ringers from Hillingdon, Ealing, Acton, Brentford, Slough and Windsor soon joined the West Middlesex, but by 1894 the Association had all but ceased to exist. At a meeting of ringers from Ealing and Isleworth in February 1894, it was re-formed as the South & West Middlesex Guild. In 1888, at a meeting held at Finchley, the North Middlesex Association was formed with members from Finchley, Edmonton and Hendon. The following year the word ‘North’ was dropped from the title, and with members from Barnet, Hadley and Tottenham also, it became very active. 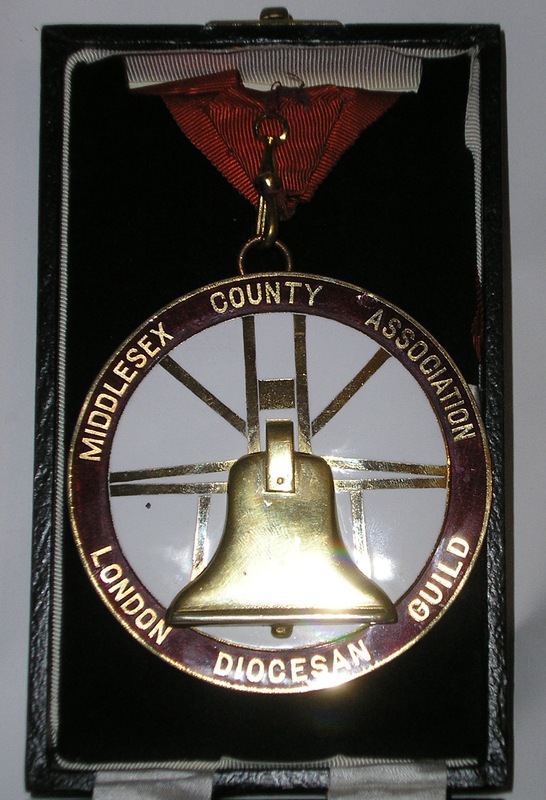 In 1896 members of the Middlesex Association approached the South &West Middlesex Guild, with a view to forming one society for the whole County of Middlesex (1889). The idea was greeted with enthusiasm, and at Ealing on Whit Monday 1897, the new Association was formed, with the Bishop of London heading the list of patrons, and the two societies retaining their identity as Districts. In 1903, at the Association AGM held at Fulham Palace, with the sanction of the Bishop of London, the words ‘and London Diocesan Guild’ were added to the title. In 1980 each District decided to form branches, In the North & East District three branches, Stepney, Edmonton and Willesden, were formed. The South & West created a Southern and a Western Branch. In 1984 the Southern and Western branches were elevated to District status, whereas in the North & East District, on the transfer of a number of its western towers to the South & West, it was felt that the whole District was again a viable entity and the branches were abolished. In 2013 the South and West Districts re-merged to form a revived South & West District. In 1997, at Whitsuntide in Ealing, the Bishop of London, the Right Reverend Richard Chartres, led the Association in celebrating its first centenary. In 2005 the Association launched its first web site. It was re-launched in December 2012 and is now appropriately within the “dot London” domain. The Association’s quarterly newsletter, Bell News, first appeared in 1994 and will soon reach its 100th issue.